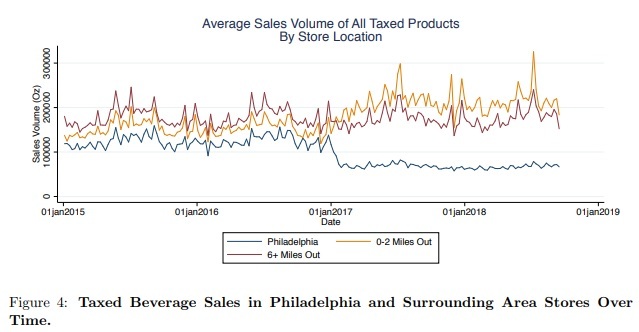 In Philly, proponents repeatedly tried to sell the soda tax as a way to get people to drink less soda, but kept getting voted down. When they re-packed the tax as a revenue generator for the City, it was quickly approved. In short, I don’t think anything about this situation is a surprise for those involved. Everyone know exactly what would happen. But, strangely enough, people in Philly keep voting for exactly the same kinds of jokers, both mayor and city council. Go figure. There’s an unwritten truism that states that if you want less of something, then tax it. It works for sales of cars, food, sodas, and even income. The politicians that approved these idiot laws didn’t want revenue for health programs or any other programs. They wanted people to drink less soda and resorted to the force of govt to “encourage” them to quit. 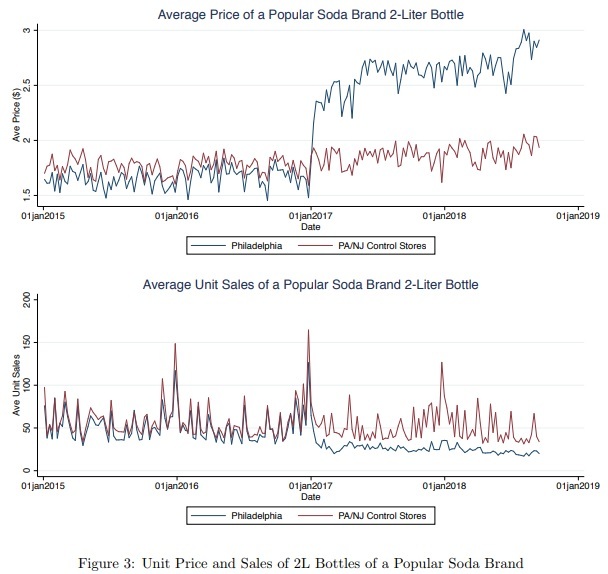 Also note in the first graph how the avg price of a 2-liter bottle increased a little in the control areas outside Philadelphia. i.e., retailers not subject to the tax probably took advantage of the opportunity to raise their own prices. Just another unintended consequence.